Have gotten my pillows made for the annual Handweaver’s Sale. The pillow above had little space for embroidery but I did get a bit on it. 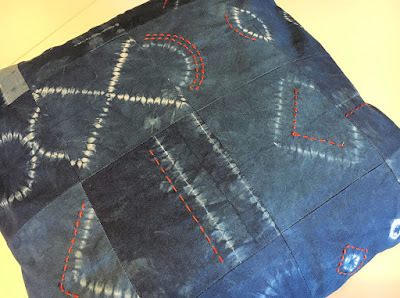 Didn’t think about the addition of stitching when I sewed the strips together. Was more concerned about getting the most interesting strips maximum exposure. This pillow had a bit more ‘in front’ space for a bit of embroidery. The embroidery on this pillow is a bit more subtle. 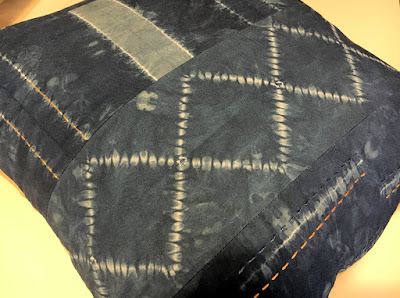 This was the only pillow with shibori designs on both the front and back so embellishment was kept to a minimum. This is the patchwork pillow and despite all the patterning I decided to add a lot of stitching in a lovely dark orange. This pillow is not going to the sale and is very happily sitting on my couch. 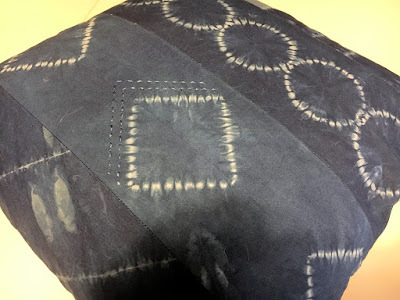 I’m now adding more shibori stitched fabric to an increasingly large pile to get ready for another indigo dye session. Stay tuned for those results. Also trying to get a little eco printing done. The results so far have been less than spectacular. 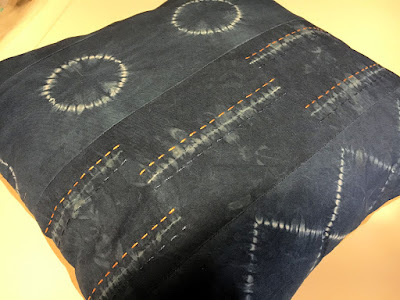 Think I’ll just concentrate on the indigo for the moment and when that is off my mind I’ll focus on some eco printing.